I took the kids camping this weekend. 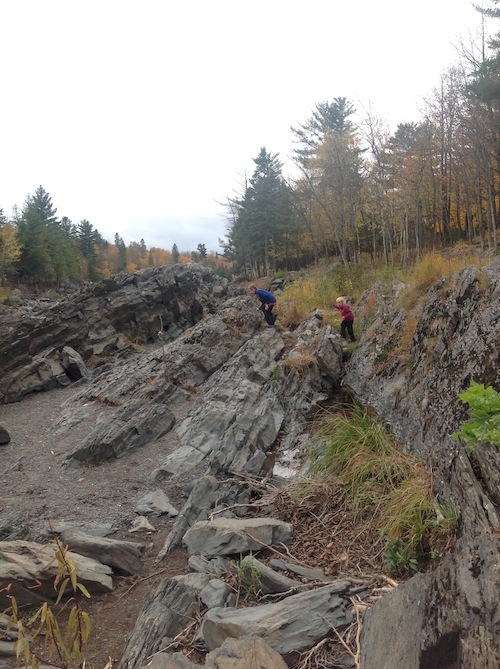 Jay Cooke State Park is lovely. I recommend a visit if you have never been. We had the following conversation at the campsite on Saturday evening. Me: Griff, we have two pears and three people. What should we do about that? Griffin (9 years old): Cut them in 3 pieces. Me: How much does each person get in that case? G: One and a third, I think…No…I don’t know. His attention returns to the campfire, which is of course endlessly fascinating. A minute later, I try again. Me: Tabitha! Two pears, three people. I’m going to cut them in half. That’s four pieces. You each get one. I get two. Fair? Tabitha (6 years old): NO! She passes a few moments pondering while I take the pears over to the picnic table. T: You should cut them in four pieces. Give each of 1, then put the other away for tomorrow. I originally interpret this to mean cut each of the pears in four pieces. Afterwards I am not so sure what she meant. In any case, I did what I thought she suggested. Me: Tabitha, I did most of what you said. We each got 2 of those pieces. There are 2 leftover. I’m going to cut those in half. We each get 1 of those littler pieces. Now what should we do with this last little piece? Me: In how many pieces? I do so and we admire our handiwork. The first fraction most children encounter in a serious way is one-half, and this is nearly always through fair-sharing. Two kids, one pear (or cookie, or cupcake, or doll…) this is where children begin to think about fractions. They do not think about the notation of fractions, but they think about the important idea of fractions: A thing can be cut into equal pieces, and there is a name for these pieces. Sharing multiple things in a way that involves cutting—as 2 pears among 3 people—is much more challenging than sharing one thing. Nevertheless, this experience of halving is so fundamental that children often want to solve everything by halving. As long as we are willing to cut halves in half, this can be a powerful way of working things out. 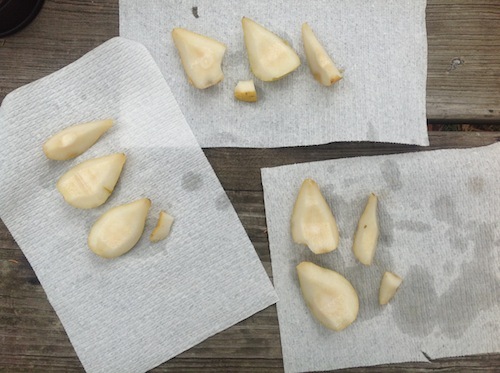 Griffin’s idea to cut each pear in three pieces, then, is relatively sophisticated. That he could not name the resulting share should be no surprise in a campground conversation where the cutting is all imaginary and unwritten. That this did not immediately occur to the younger child is no surprise. Likewise the idea to save the extra piece for another time is typical of young children’s thinking about fair sharing. Cutting that last piece into three was a triumphant idea for her. See Extending Children’s Mathematics for lovely, detailed writing about these ideas. Buy two pears. Get yourself two children of different ages. Ask them how to share the pairs fairly. Do what they tell you to do and ask follow up questions such as Is this fair? Do we all have the same amount? How do we all have? and What should we do with these leftover pieces? This entry was posted in Number and tagged 6 years old, 9 years old, camping, Griffin, pears, Tabitha. Bookmark the permalink. This relatively new blog by my colleague Christopher Danielson, should be a must-read for parents and teachers of young children. Not a campfire fan myself, so I’d probably be more tenacious about the slicing ideas than Griffin was. More importantly, I love the fact that he thought about the three slices AND that you were patient enough not to jump at that idea and force it through to its conclusion. Do you suspect that a future conversation along these lines would arrive at the slicing by three idea more quickly? In other words, do you suspect that this has qualified as a learned solution yet? Also – I imagine that a similar conversation with my 10 year old and my 4 year old would inevitably result in some patently unfair solution being offered up. Bravo to Griffin and Tabitha for being essentially fair in their solutions. mrdardy asks, Do you suspect that a future conversation along these lines would arrive at the slicing by three idea more quickly? This is a lovely question. Short answer is yes. My experience time and again is that kids remember and apply the ideas of the conversations we have. Long answer is maybe not in the next conversation. We all have had the experience of understanding something, then feeling as though we do not understand it again. This is a natural part of learning. How many conversations that end in thirds does Tabitha need before she can start with thirds? I have no idea. I’m sure it will come up again and I’ll report on that. Great insight here – kids reason about fractions on an “as needed” basis. Our job as teachers is to create that need and help students to construct an understanding of fractions, division, and so on. I’ve been having a lot of conversations about fractions with secondary teachers and some of the mathematicians that I work with (separately). This idea that halves, thirds, and tenths are cognitively different just blew my mind. I’m curious, though, what your kids might do with the idea of splitting something continuous instead of discrete. I’m asking because one of the mathematicians I work with suggested that it makes more sense to teach fractions by splitting the distance from zero to one on a number line than by using a part vs whole method. Do you have any thoughts on that?